Massachusetts Child Support Lawyer | Farias Family Law, P.C. Child support law requires the non-custodial parent to contribute financially to child-rearing. It usually consists of fixed regular payments from the non-custodial parent to the custodial parent. The amount can be determined between the parties. 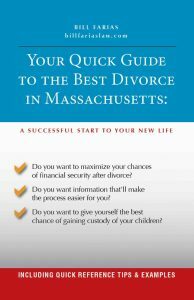 However, if there’s no agreement, it’s determined by application of the Massachusetts Child Support Guidelines, which is a calculation involving a number of factors. In addition to the support they pay, non-custodial parents are expected to contribute to the child gifts, transportation, and clothing, which doesn’t count toward child support. Additional expenses for the child may, however, be considered in setting the support amount. On August 1, 2013, new Massachusetts Child Support Guidelines are in effect. Under G.L. c. 208 sec. 28, absent an agreement between the parties or a court order, the Massachusetts Child Support Guidelines are used to determine the payment amount. The guidelines generally apply when one parent has sole physical custody. Child support is based largely on the paying parent's gross income and the number of children that are part of the support order. There are a number of other considerations (factors), but they don’t carry nearly as much weight. Defined very broadly, and includes salaries and wages, trusts, social security, prizes to name only a small few. If the paying parent is not making a reasonable effort at obtaining income, the judge may consider his earnings potential instead of his salary. Can be a defense to a request for an increase in support, but the paying parent cannot get a lower payment for this reason. Payments can either be exchanged privately between the parents or through income assignment. Parents have the option of handling payments between themselves. However, the receiving parent always has the option to utilize income assignment, which involves either the paying-parent or his employer (through pay deduction) sending payments to the Department of Revenue (DOR), who then sends it to the custodial parent. A parent that initially agreed to private payments and is not receiving regular payments can always request a change to income assignment. One advantage to having the DOR involved is that they can assist with collection and enforcement. In general, if the amount recommended by the Guidelines differs from the current payment, the parties are entitled to a modification. Some events that may trigger a different payment amount are a major illness, job loss, a significant pay raise etc. If there is an issue with payments, the receiving parent can file a complaint about contempt with the court. After the complaint is filed, a hearing date is set, at which the paying parent must answer to the court for the missing payments. As mentioned above under “How Payments Are Made,” one benefit of using income assignment is that the DOR can assist with collection and enforcement. Despite payment issues between the parents, visitation should not be affected by child support payments (or lack thereof). A major mistake that some parents make is using visitation for leverage on child support issues. The court frowns upon this, and you should never do it. Payments usually stop when the child reaches age 18 but may continue to age 21 if the child lives with and is dependent on the receiving parent, and may be extended to age 23 if the child is enrolled in an undergraduate education program. Child support is an important determination in a divorce proceeding because of its significant financial ramifications. Make sure you have a skilled, aggressive attorney that will get you the best result. 1. Can I take a new job that pays less and reduce my child support payment? If the court believes that you’re underemployed, it may use “income attribution” to establish your child support at a level consistent with your earnings capacity. If you intentionally went from earning $150,000/yr to earning $100,000, the court may set child support as if you were still earning $150,000. Technically, the other parent must produce evidence that you can earn more in order for the court to attribute income. However, if it’s obvious that you’re taking a hit in pay solely for the purpose of lowering your support obligation, the court may on its own set your obligation higher. 2. How to decrease child support payments? You must file a complaint about modification asking for a decrease in child support. Usually, this happens when either 1) the child is spending much more time with you than when the last order was entered, or 2) there’s a significant change in your financial circumstances, such as, for example, decreased income or increased and substantial medical or travel expenses. 3. How to stop paying child support? You must file a complaint about modification asking for the termination of child support. Support will sometimes automatically terminate when the child turns 21. However, it’s advisable to take action with the court to minimize the risk of accumulating arrears. There are a couple of circumstances under which your child support obligation could end. First, your obligation may end if there’s a significant change in your parenting time and you have the child in your care more. Another way child support may end is if the child becomes emancipated: for example, the child moves out of the home and no longer lives with the other parent or joins the military full-time - these are a couple of examples of circumstances that would end your obligation.